Biophilic cities recognize that urban areas could support even more nature, as the High Line in New York City does. Nature is not optional. It is absolutely essential to leading a meaningful, healthy life. Evidence is growing that nature can ameliorate a host of modern ills. Being around it can relieve chronic stress and propel people to relinquish their sedentary lifestyles. Nature induces creativity, encourages generosity, and facilitates longer-term thinking. Employees tend to be happier and more productive when their offices have ample daylight, greenery, and views of nature. Biophilia is the innate connection people have with nature, that hard-wired need for contact with other life forms and the natural world. Popularized by Harvard biologist E. O. Wilson, biophilia is becoming more mainstream in architecture and design—especially in urban settings, where nature should be all around, not just something to occasionally visit. In recent years, the focus of my own work has been similar: to raise awareness about applying biophilic concepts and principles to the design of cities. In 2011, I launched the Biophilic Cities Project at the University of Virginia to further explore the idea of biophilic cities, which are metropolitan areas that foster deep connections to the natural world by prioritizing the protection and restoration of flora and fauna and integrating new forms of nature—from trees and gardens to green walls and rooftops—into urban neighborhoods and built environments. 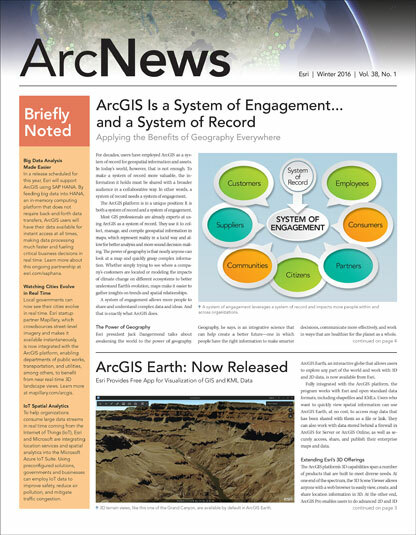 At the heart of this concept, really, is geodesign. The biophilic cities movement is a novel way to understand cities—one that sees them not as disconnected from nature but, rather, embedded in it. The movement encourages urban planners to take a more holistic view of places and spaces within a city and make room for biodiversity. This requires infusing all levels of urban design—from buildings to neighborhoods to entire cities—with scientific information about the natural environments at hand, as well as a sense of how people can and would want to interact with nature. Singapore's quest to be known as the City in a Garden is boosted by hotels planting rooftop gardens, like these sky gardens on top of the Parkroyal on Pickering Hotel. The Biophilic Cities Project has worked with a number of partner cities—including San Francisco in the United States, the city-state of Singapore, Wellington in New Zealand, and Birmingham in the United Kingdom—to explore the different ways a city could be biophilic. 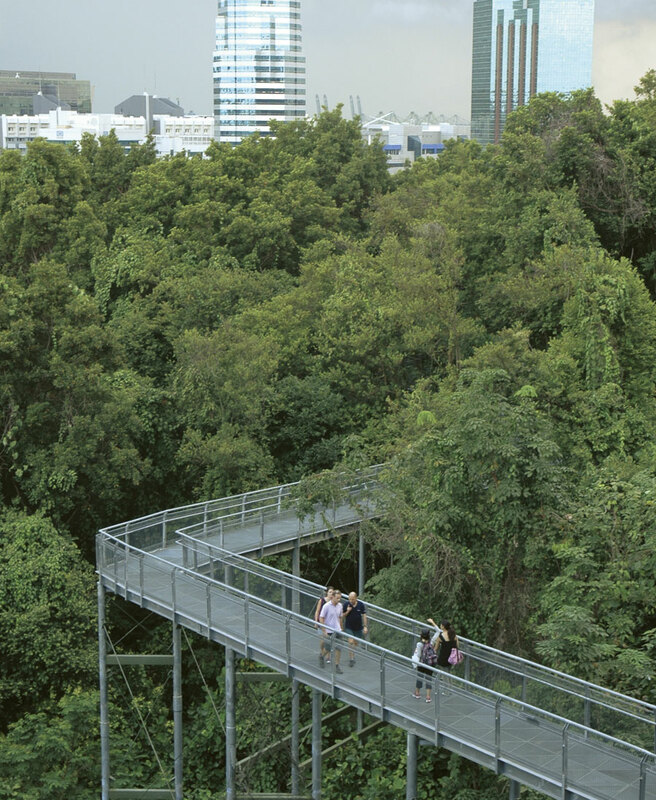 Singapore, for example, has an impressive network of trails and pathways that connect parks and green spaces to one another. These park connectors allow people to walk, bike, and jog between various green spaces without leaving vegetated areas. 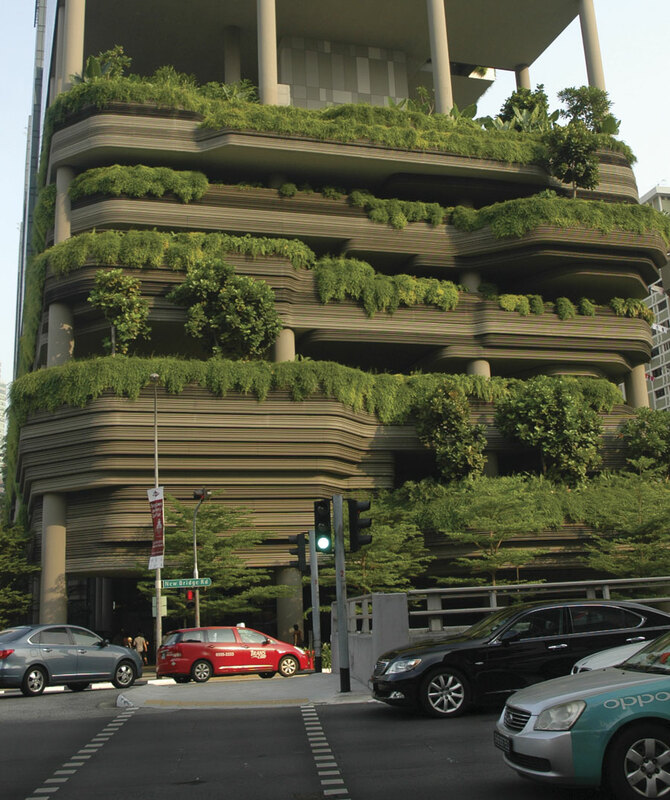 The city-state has also made considerable efforts to integrate nature into its vertical spaces. A number of high-rise apartments, office buildings, and hotels have installed green roofs and indoor hanging gardens to help reduce the effects of urban heat island (wherein a metropolitan area is warmer than its surroundings because of escalated human activity). Through these and other efforts, the Ministry of National Development wants Singapore to be known as a City in a Garden rather than the Garden City (its previous sobriquet)—a small but important change to help overcome the bifurcation of what’s considered urban and what’s deemed nature. Developing an ecologically rich and intertwined network of natural features and habitats—from installing vertical gardens and green roofs to planting trees and expanding urban trail networks—allows cities to deftly reduce their carbon emissions and inherently adapt to climate change. Additionally, when metropolitan areas make room for the natural movement of fauna, they gain a better understanding of the locations and movements of birds, bats, pollinators, and other animals. Edmonton, Canada, and Brisbane, Australia, for example, have both invested in wildlife bridges and faunal passages of various kinds, which allow animals to move and thrive in the midst of built environments and overcome significant habitat barriers, such as roads and highways. All of this informs biophilic design and planning. Each city participating in the biophilic cities movement uses GIS in some way to support nature-focused geodesign. Many of these cities employ GIS to take stock of the natural environment around them—calculating tree canopy coverage, for example, or estimating how much of the urban population can walk to a green space in 5 or 10 minutes. Other cities use the technology to do analysis. Birmingham, which is aiming to be the first biophilic city in the United Kingdom, has mapped out urban heat and air quality levels to identify locations where green and blue interventions, such as planting trees and vegetation or incorporating water, would be most effective. In collaboration with the University of Birmingham, the city also recently developed a high-resolution map of its nighttime lights to better understand their impact on the community (which tends to have less of a relationship with the night sky where streetlights are more prevalent) and local ecological systems (such as the bat population and its changing flight patterns that dodge lit areas). The eventual goal is to balance the need for public lighting with preserving wildlife habitats and reducing light pollution. Park connectors, like this one in Singapore, allow urban dwellers to walk, bike, and jog from place to place without leaving vegetated areas. Mapping urban soundscapes is important, too. One metric of success for biophilic cities is ensuring that every resident in every neighborhood can hear rich birdsong. To this end, Wellington has implemented a bold initiative called Zealandia that seeks to restore native bird populations to places where they were previously decimated by nonnative predators like house cats. The city erected a predator-proof fence around a preserve, where several bird species endemic to New Zealand have rebounded. Because of the preserve’s proximity to downtown Wellington, native birdsongs have once again become profuse in the city. Cities are ecosystems composed of humans, animals, insects, and their respective, though not mutually exclusive, habitats. Biophilic cities grasp this. They also, crucially, recognize that urban areas could support even more nature. As the world continues its shift toward increased urbanization, serious challenges to sustainability and resilience remain. New solutions are needed—many of which lie in creating new ways to understand urban life. Geodesigning biophilia into cities creates and strengthens urban connections to nature, meaning that biophilic cities are, almost by definition, sustainable and resilient cities. This profoundly new way of understanding urban environments is framing people’s aspirations for the future of urban living. The Biophilic Cities Project is gaining momentum globally, with new initiatives emerging across the United States—from Portland, Oregon, and Milwaukee, Wisconsin, to Washington, DC—as well as in European cities, such as Vitoria-Gasteiz in Spain’s Basque Country. Ideally, in all these cities, and more, there will come a point when residents and visitors cease thinking that they must travel to parks and green spaces—or even outside the city—to find nature. Instead, they will be immersed in nature all the time. Tim Beatley is the Teresa Heinz Professor of Sustainable Communities in the Department of Urban and Environmental Planning at the University of Virginia. With funding from the Summit Foundation and the Cynthia and George Mitchell Foundation, his Biophilic Cities Project has shared many stories about emerging biophilic cities. His new book, Handbook of Biophilic City Planning and Design, continues that effort. For more information on the Biophilic Cities Project, visit the website or email Beatley.